California filed a lawsuit on Wednesday to stop construction of the border wall advocated by President Donald Trump as a key campaign promise. The suit claims the administration did not abide by laws requiring an environmental impact review and is acting without statutory authorization, report the Washington Post and the Los Angeles Times. The suit also claims violation of the Fifth Amendment’s due process clause due to a lack of notice about project plans, and violation of separation of powers principles through a reassignment of powers to the executive branch. Thirty-seven federal laws were waived for the project, according to California Attorney General Xavier Becerra, who announced the suit at a press conference. The Los Angeles Times covered his remarks. Trump signed an executive order in January authorizing the Department of Homeland Security to identify and allocate sources of federal funds for the border wall project. California’s Imperial and San Diego counties are among the locations where initial construction is planned. 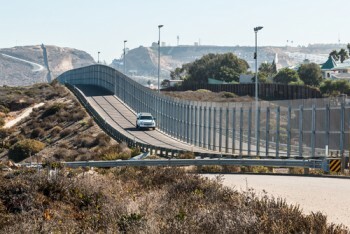 California says the suit seeks to protect interests that include maintaining tourism and trade with Mexico, and managing environmentally sensitive property next to the border. “In looking at the case, they are making a stronger and more persuasive argument than I anticipated when I first heard about it,” he said.